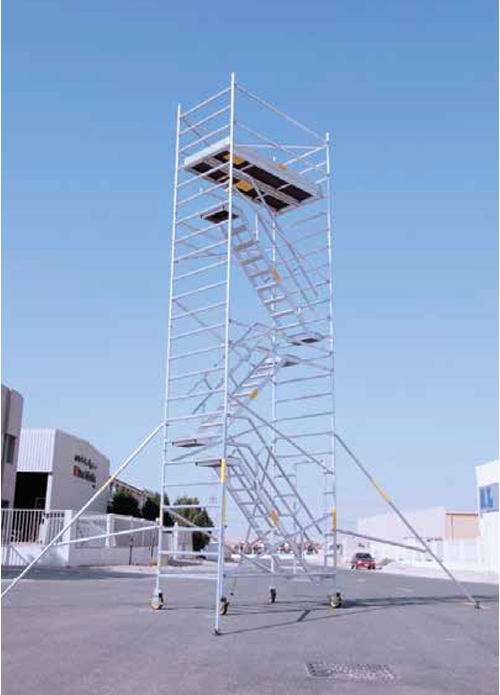 Safe working load of 250kg per platform level up to a maximum of 750kg per tower (Including tower self weight). Deck board edge protection by Aluminium Deck profile. Easy to use toe board system. Whole life support includes manufacture’s repair service. Stairway can be placed both zig zag and parallel. Adjustable leg up to 30cm. 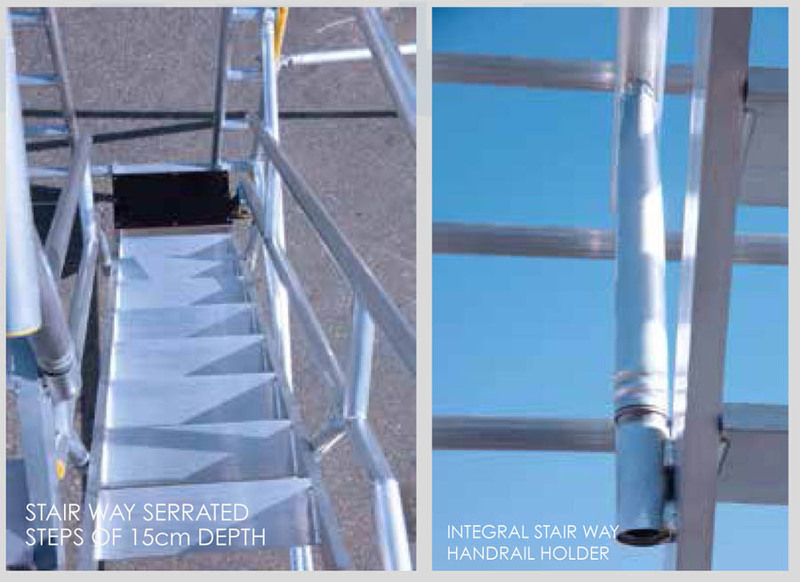 Integral stairway and handrail system is ideal for frequent ascend and descend inside the tower. Safe and simple to transport equipment on a scaffold tower. Equipped with antislip profile on stairs. Stairway and platform equipped with windlock security system. Stairway steps are 15 cm deep with a clear width of 49 cm making it easy to carry tools. The step rise is 19 cm. 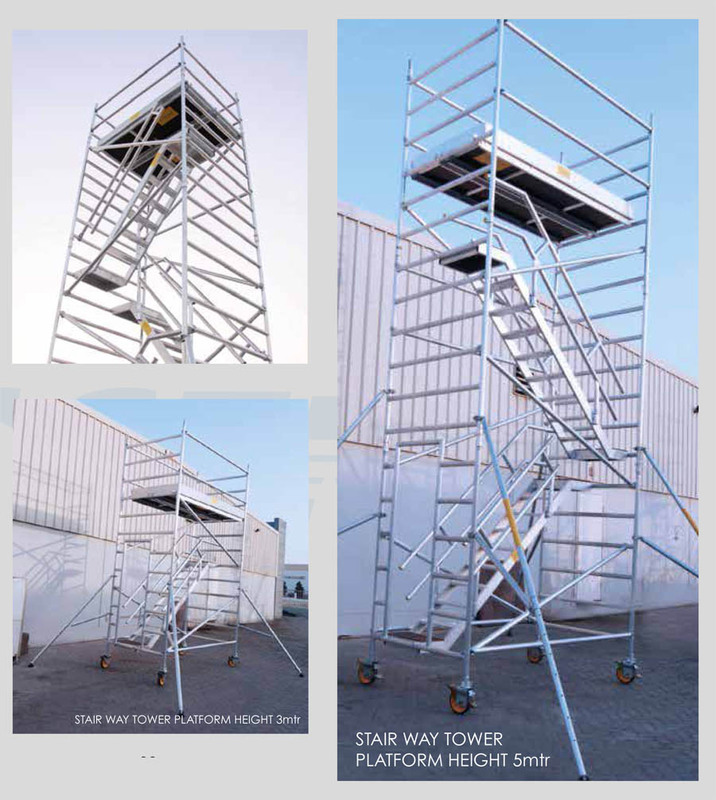 Stairway large trapdoor platform – The light weight walk thru platform which is larger than standard trapdoor platform provides additional head clearance while climbing the tower and ease of access to the working level. Easily detachable handrails available for both the side of stairs. The standard and trapdoor platform provides a larger working area and complete top working level, with easy attach toe boards.